The Marine 31 Canvas & Fabric Care Kit contains everything you need to clean and protect your boat�s interior and exterior fabric surfaces. 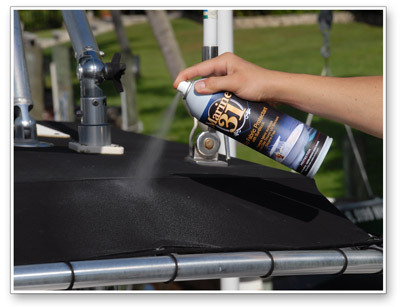 From bimini tops to sail covers, this kit includes the best marine fabric cleaner and protectant to shield your boat�s fabric surfaces from UV rays, salt, bird droppings and virtually anything else nature can attack your boat with. The kit includes essential items like a super-soft Horse Hair Brush and several plush microfiber towels, giving you everything you need to do the job the right way. Your boat�s t-top is designed to provide shelter and shade from the sun and other outside elements. If the fabric or vinyl cover on your t-top isn�t properly protected, it will experience premature wear and will eventually need to be replaced. Marine 31 T-Top Fabric Protectant with SunBlock protects fabric bimini tops from UV-induced fading, saltwater, rain, insects and bird droppings. Bimini tops, sail covers and fender covers are expensive to replace. Keep them looking and performing new with the Marine 31 Fabric Cleaner & Protectant Kit! Marine 31 T-Top Fabric Protectant with SunBlock provides the best UV protection for all exterior and interior marine fabric surfaces including old and new bimini tops. Formulated using SunBlock technology � a fusion of Marine 31�s proprietary UV absorbers and advanced Ciba Tinuvin UV Blockers � treated surfaces will retain their color and texture while repelling dirt, dust, oil, grease, acid rain, salt, insects and bird droppings. 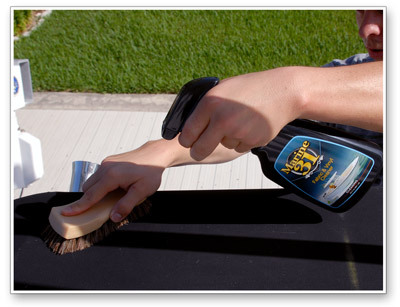 Regularly treated surfaces will resist UV-induced fading, cracking and discoloring. This CFC-free formula meets California�s strict air quality standards.